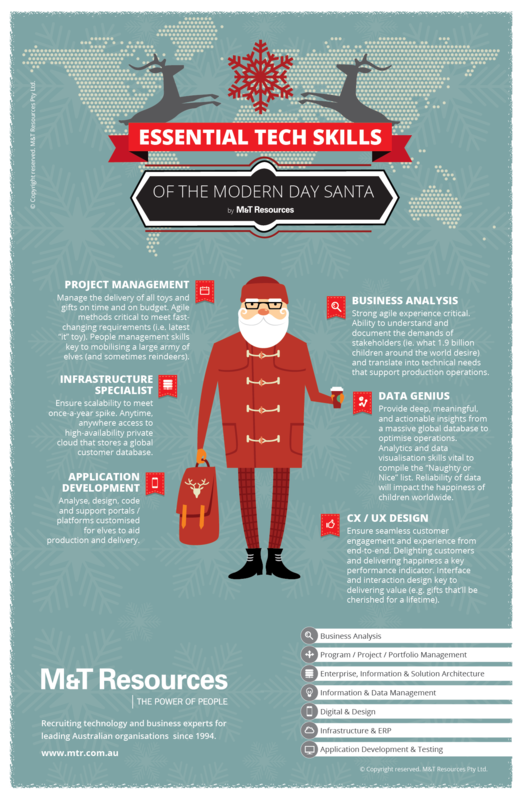 What tech skills would the modern day Santa need? The legend of Santa Claus can be traced back to the 3rd century. But if Santa were to produce enough toys for 1.9 billion children that we have in the world today, we can imagine that he’d have a pretty sophisticated and modern operations in place. In fact, with the major leaps and bounds in technology advancements, customer-centricity thinking and agile project management that we have access to today, we’d imagine that Santa would be quite an innovative Chief Information / Technology Officer, don’t you think? Here’s an infographic that we’ve put together this Christmas when we imagine some of the essential technology skills that would benefit the modern day Santa. What other tech skills do you think Santa should have? On behalf of everyone at M&T Resources, we sincerely thank you for your support throughout the year. We wish you a most wonderful holiday season with your loved ones and an even more successful year ahead!